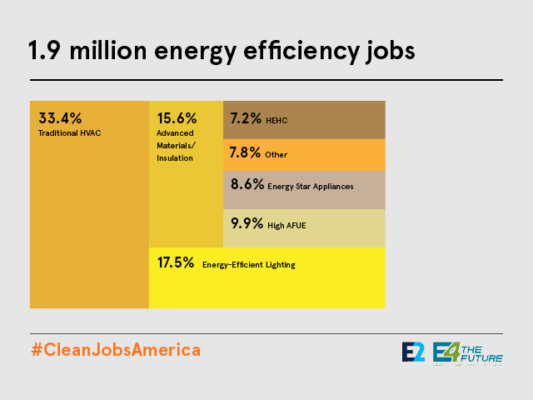 E4TheFuture Energy Efficiency Jobs Matter to U.S.
See Energy Efficiency Jobs in America. It is “the best job I’ve seen yet of providing a reliable answer” to the question of how many jobs exist in the sector, says Jim Barrett, Chief Economist at ACEEE. See this week’s ACEEE blog. By growing energy efficiency we can meet multiple policy objectives, from lowering emissions to improving human health. It is notably the only energy resource that can be said to increase the income of its program participants, by putting dollars into their wallets. Energy savings translate into pocket money that infuses the economy overall, a real economic driver that is beyond the scope of this jobs report. 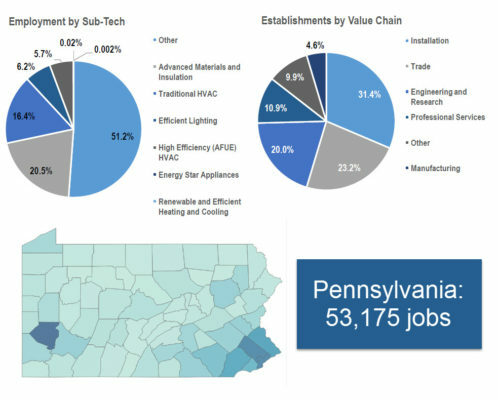 Energy efficiency is a major source of jobs in the U.S. As you will notice, all states have substantial numbers of jobs in energy efficiency—blue states and red states alike. One example is the Commonwealth of Pennsylvania, illustrated here. All 50 states are detailed in our report. This is an energy resource for every community in America, with vast potential for further growth. It drives jobs and economic development wherever it is supported. However, states’ policy progress has been uneven. The report illuminates how promoting smarter energy use can feed this thriving industry. Our country seeks to create new jobs, despite trends toward increased automation and globalization. The energy efficiency industry comprises many small businesses and by its nature must be focused on locally offered services that cannot be outsourced. Boosting energy efficiency can drive jobs and economic development wherever it is supported and emphasized. Energy efficiency is an energy resource for every community. If elected officials want to create jobs, drive economic growth and save consumers money, they should embrace the energy efficiency sector. E4TheFuture seeks to build understanding and access to relevant data. We are grateful to our partners in this report for providing a comprehensive analysis of facts. New blog posts by the Alliance to Save Energy and ACEEE serve to echo, amplify and validate the importance of this report. Please contact info@e4thefuture.org if you have questions or would like to discuss Energy Efficiency Jobs in America or other ideas related to advancing the clean energy industry.